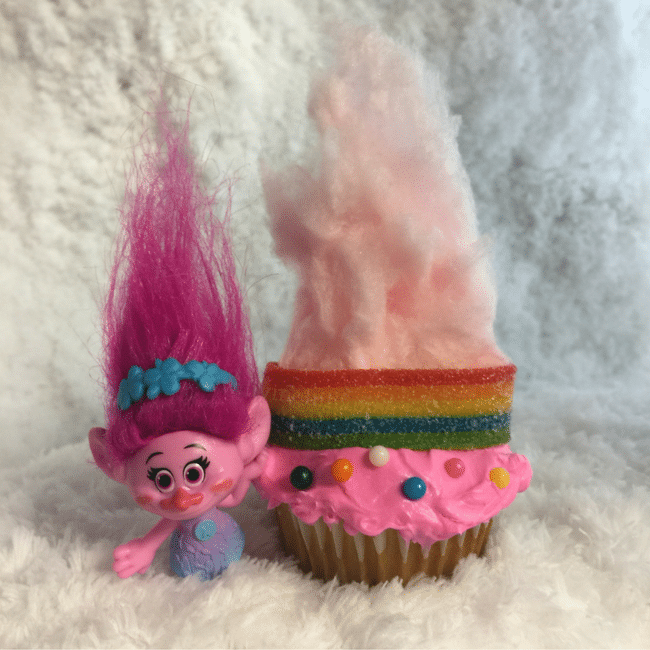 Looking for the perfect Trolls cupcake idea? 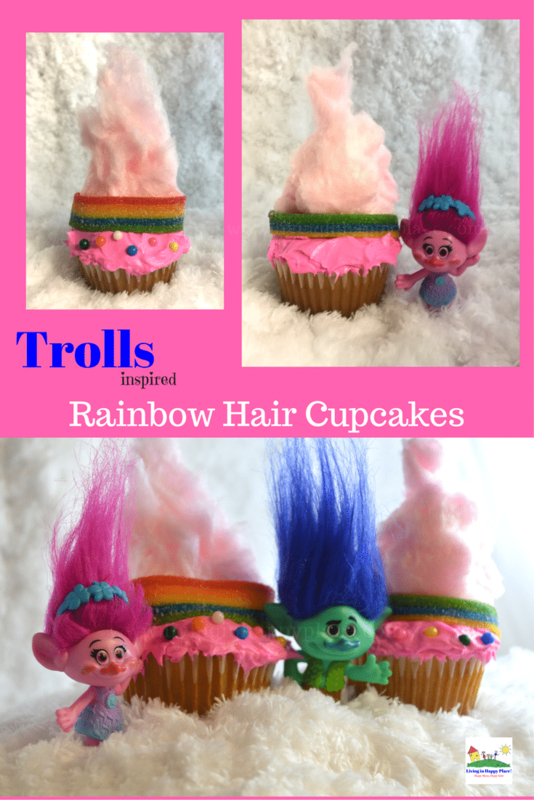 Well put your hair in the hair for these easy and colorful Rainbow Hair Trolls cupcakes! If you have kids in your house, then I would bet you know the entire Trolls soundtrack by heart. I feel like Justin Timberlake lives here because we are listening to the soundtrack by 10 am every morning. And just when I think I have the songs out of my head- they release Trolls Holiday. You caught me. I love the movie as much as my kids do. 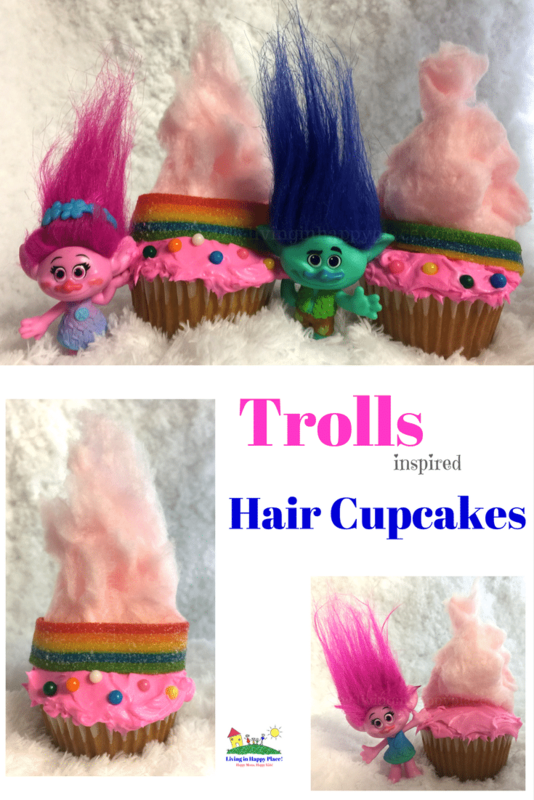 That’s what inspired me to come up with these fun Troll-hair cupcakes! (Cupcakes & rainbows, right?) 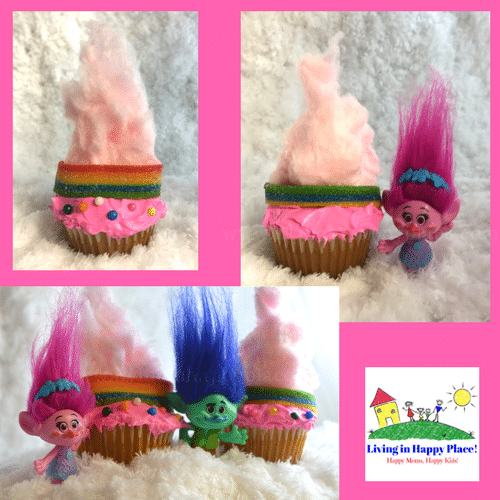 They are easy to make and perfect for birthday parties or your own at-home movie release party (animated series start January 19, 2018 on Netflix and Trolls 2 is planned for 2020) ! While we wait for Trolls 2, let’s make cupcakes! Bake cupcakes in your favorite flavor and allow to cool. Select pink icing (or add a drop of red food coloring to white icing and stir). If you have a big Branch fan in the house, you can also use blue icing. Ice cupcakes. 3. Pull cotton candy in a medium sized piece to resemble the tall, fuzzy troll hair. This took me a couple of tries to get a piece I liked. You can pinch the top to get a point-shaped tip. 4. Take a piece of rainbow Airhead Xtremes and place around bottom of the hair. The icing should help hold it in place. 5. Add colored sprinkles or candy pieces to the icing in front of the rainbow (optional). Wilton does make an edible glitter that would go well with the Trolls theme. I have never tried it myself but it looks super cute! 6. Eat Troll cupcakes and be happy! 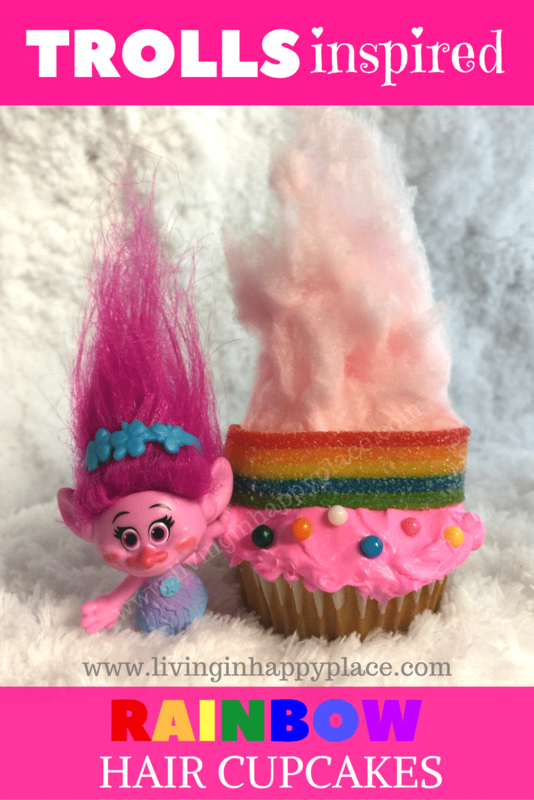 Now you have everything you need to be happy- Trolls and cupcakes! Select pink icing or add a drop of red food coloring to white icing and stir. Ice cupcakes. Pull cotton candy in a medium sized piece to resemble the tall, fuzzy troll hair. This took me a couple of tries to get a piece I liked. You can pinch the top to get a point-shaped tip if you want. Take a piece of rainbow Airhead Xtremes and place around bottom of the hair. The icing should help hold it in place. Add colored sprinkles or candy pieces to the icing in front of the rainbow (optional). Wilton does make an edible glitter that would go well with the Trolls theme. I have never tried it myself but it looks cute! *Living In Happy Pace is in no way endorsed by or associated with Dreamworks or the Trolls franchise. 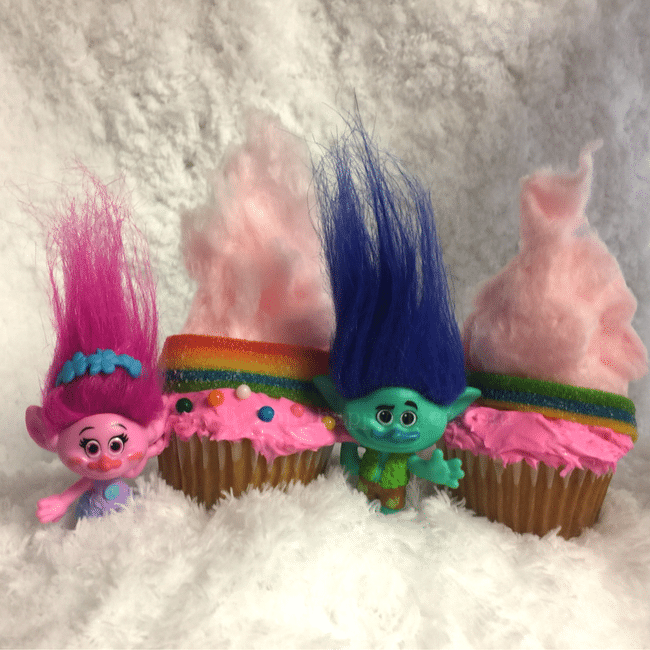 Who will you share your Trolls cupcakes with?